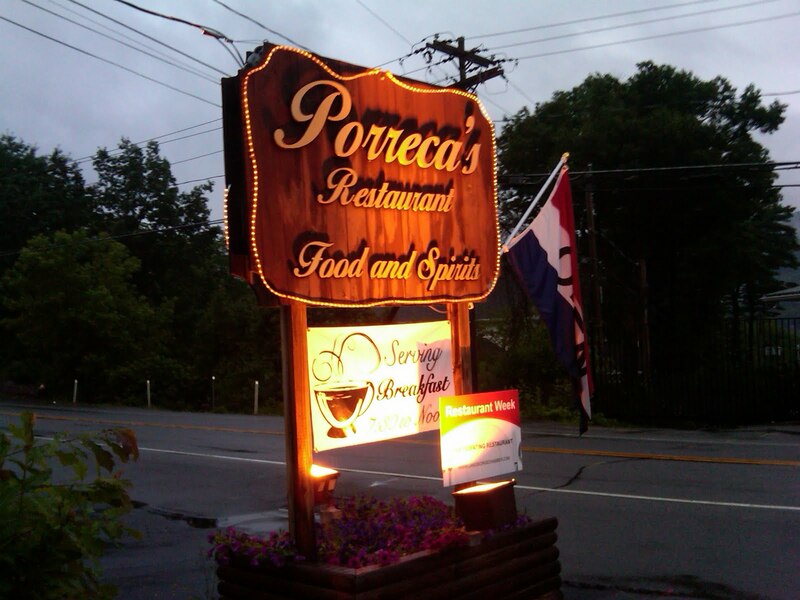 Let’s just cut to the chase here — Porecca’s Restaurant is one of the best restaurants I’ve dined at in Lake George, and easily ties my previous favorite eggplant rotolini of all time. The food and the service were excellent and the atmosphere was very welcoming. After looking through the menus for Lake George Region Restaurant Week, I decided Porecca’s was where I wanted to try first, because of all the vegetarian options on the restaurant week menu. The eggplant dish was first to catch my eye, and how could you beat a three course meal at this place for only $20.11? First off, they start you out with fresh focaccia tasting bread and homemade butter. 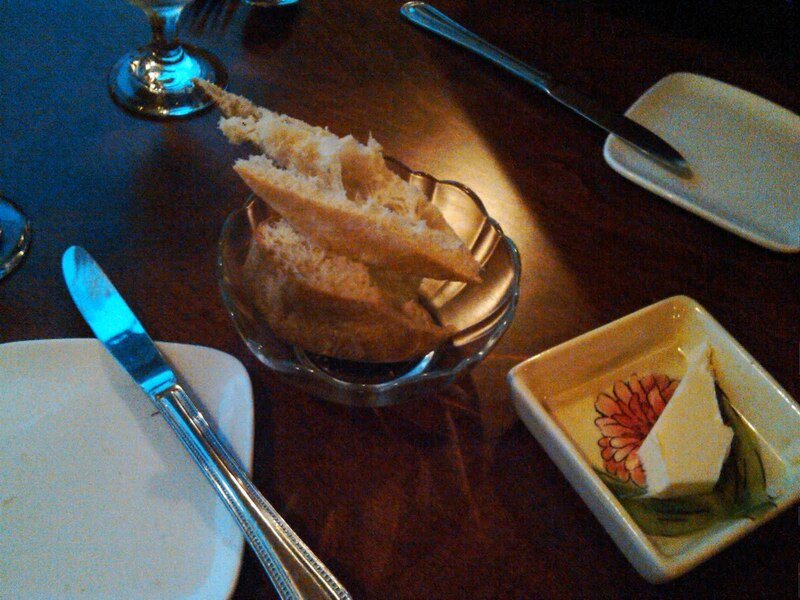 Typically, I would have been disappointed because they were serving butter instead of olive oil, but then I tasted it — the butter was creamy, soft and spread perfectly without completely melting. For my appetizer, I ordered the mozzarella and tomato salad, which features layers of homemade fresh mozzarella, heirloom tomatoes and basil drizzled in a balsamic reduction. 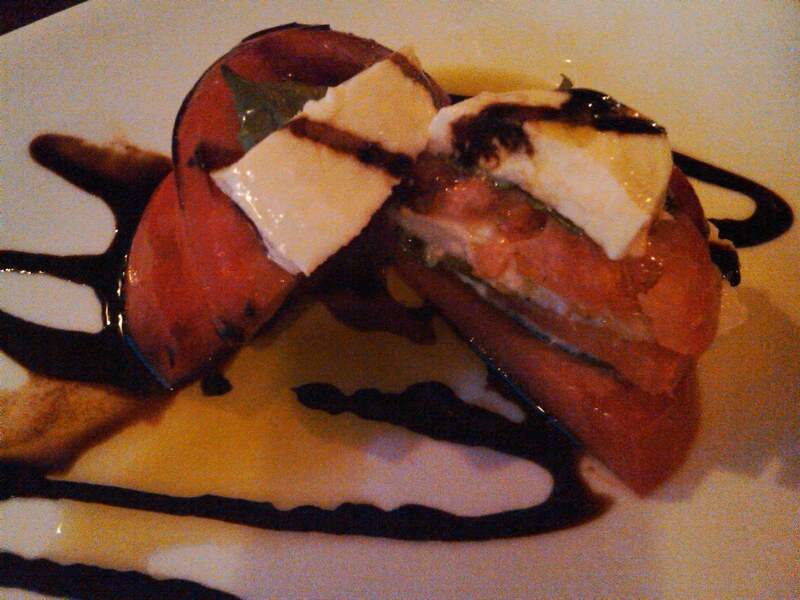 Lines of the balsamic reduction soaked into the top layer of mozzarella to give it a bold, but not too strong flavor. 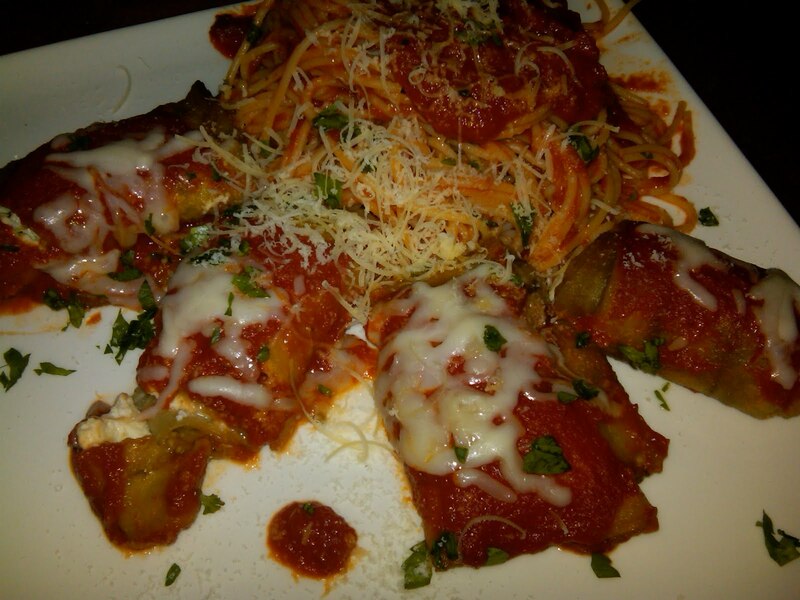 Next came the main course — eggplant rotolini. Oh.My.Gosh. Everything tastes very fresh, like it is made-to-order. I really love that it’s also all homemade — the cheese, the butter, the cream, the ricotta — everything! As if the meal wasn’t rich enough, it ended with homemade pan cotta — a vanilla flavored Italian dessert that was so rich, creamy and sweet. It started with a vanilla flavor and finished with a very light citrus aftertaste. I love that it’s served in wine and champagne glasses! 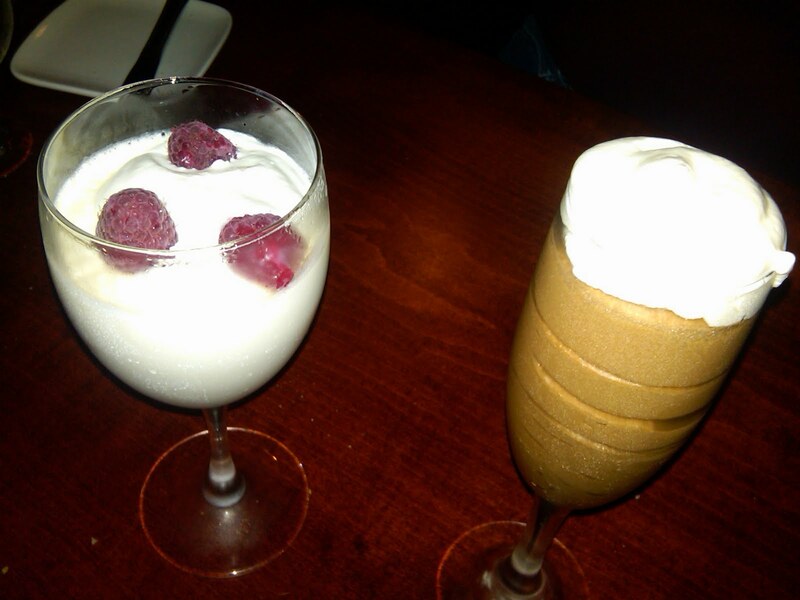 In case you’re curious, the dessert on the right is their chocolate mousse. It has a powerful dark chocolate taste that gives you the sensation of a chunk of expensive chocolate melting in your mouth. *Give yourself plenty of time. It’s a small restaurant, and they don’t rush you. *Much of the wine list is by the bottle. Order the bottle, it will come out cheaper. *If the outside dining area is open, try to get the table furthest to the end/wall, because you’ll have a view of the lake. *In addition to the restaurant, they have a nice bar area perfect for grabbing a quick cocktail, meeting for a first date or enjoying a glass of wine while you wait to be seated. I'd like to go to this restaurant because I want to taste the The eggplant I've heard that is delicious, specially because it has different types of cheese. For many persons, this will be a highly rado replica watches featuring a mix of black shades and tones, innovative external surfaces, in addition to indisputable hobby mind-set (many black color, plastic strap). However, soon after planning on that check out for a short time, When i however a bit mystified in what everthing suggests, what exactly sensations this model needs to help disclose in this particular rolex replica sale or maybe the way it assists this model eventually. Check out hands and wrists is usually stated to be an important ingredients within a check out. Since they are modest in addition to gentle in addition to weather resistant possibly be placed/ taken away effectively, exclusive instruments are expected both equally to help tag heuer replica uk these individuals in order to take them of. Give location in addition to doing away with instruments please that need to have. This Bergeon 30019 Perfection Give levers is usually a couple check out instruments that's recommended by means of authorities in addition to amateurs similar. This software is usually properly nicely balanced with fake watches connected with appearance in addition to think. The item assists in this protected in addition to fresh treatment connected with check out hands and wrists seeing that this can be a perfection software. It offers a highly shiny do the job exterior in addition to incorporates hard aluminum. It offers some sort of knurled cope with intended for ease in addition to beneficial golf grip. Bergeon 30636-1 Preston give doing away with software is usually an suitable software intended for doing away with time, a few minutes in addition to moments hands and wrists safely and securely nevertheless definitely not modest chronograph hands and wrists. The item omega replica that has a switch defender. While using the Bergeon 30671-7 Perfection Give Removers, hands and wrists, cannon pinions, effort small wheels in addition to chronograph driving a car small wheels is usually taken away safely and securely.